In the summer, thousands of people go to the shore. Whether to relax on the beach or walk on the boardwalk, there are activities available for everyone. Why not throw on a girl’s bathing suit and see if you can find anyone sand sculpting? You will be shocked to find people are building more than just a sandcastle with a moat around it. To find the best of the best, head to the World Championship of Sand Sculpting. 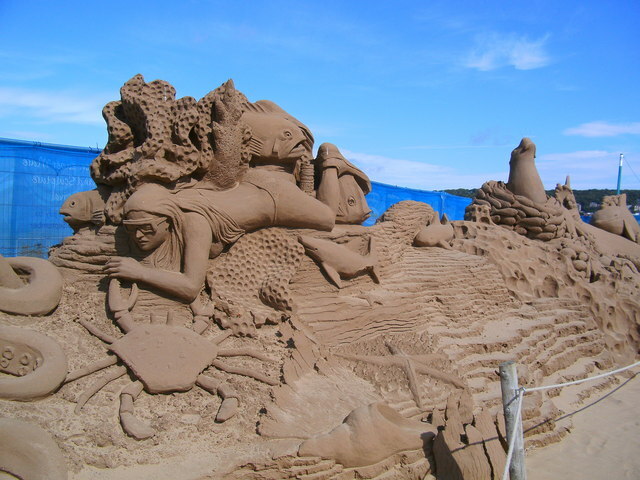 Here you can see people compete individually or in pairs to sculpt the best out of sand. And this isn’t just in reference to sandcastles the kids make. In 2011, Damon Landlois of Canada beat out 24 international individual sculptors with his “Fallen Empire” in Fort Myers, Florida. His inspiration was tyranny and the fact that it always falls. When completed, the sculpture was that of a Roman solider leaning on a column that collapsed. A perfect end to the summer was sculpted by third place doubles partners Brad Goll and John Gowdy with their piece called “Back to School Nightmare,” which features a child in bed scared to be going back to school. Sometimes, all you want is a sandcastle. Maybe this year though you want something bigger than usual. Why not think outside the castle in this case? Every girl has dreamed of being a princess, so why not build the perfect castle for your favorite girl in your life? If she has a favorite Disney Princess, sculpt the castle of her favorite princess. Boys are into video games and sports, so why not try to build your favorite team’s stadium or video game character? Nightmares and castles aren’t the only sand sculptures out there. You will be able to find sculptures recreated of your favorite movie, character, sports team, or whatever. Do you enjoy a certain period of history? If so, you can bet that there’s a sculpture somewhere of that too. No matter what you do this summer, throw on your favorite girls bathing suit and hit up the sun and sand. If you are ambitious enough, see what kind of sand sculpture you can make. Who knows, someone may stumble upon it later on in the day and be amazed. Sculptors let their imaginations run wild with what they create. Whether it is just creating something other than a sandcastle or making your castle extraordinary let your imagination run wild. To find out where you can see even more great sand creations, contact Jeana Olchowy. Follow her at @jolchowy25 on Twitter.